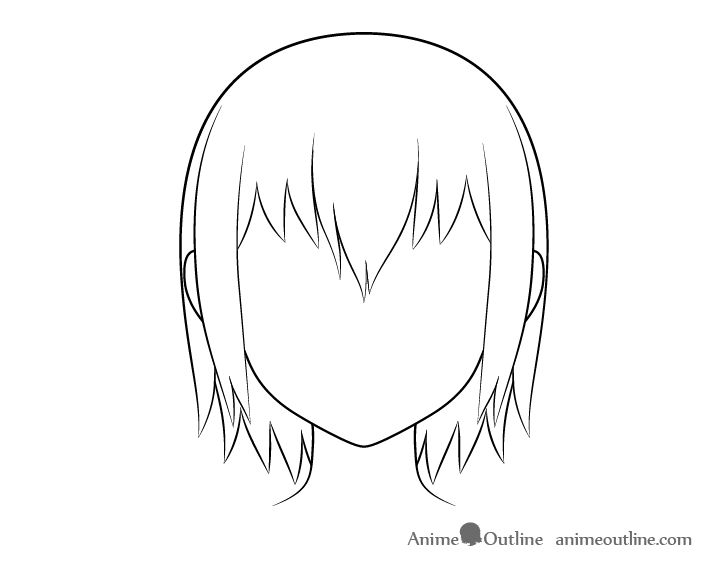 This tutorial shows how to draw wet anime and manga style hair with a step by step illustrated instructions. 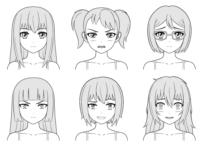 It also provides overlapping examples of how drawing wet hair differs from drawing normal/dry hair. 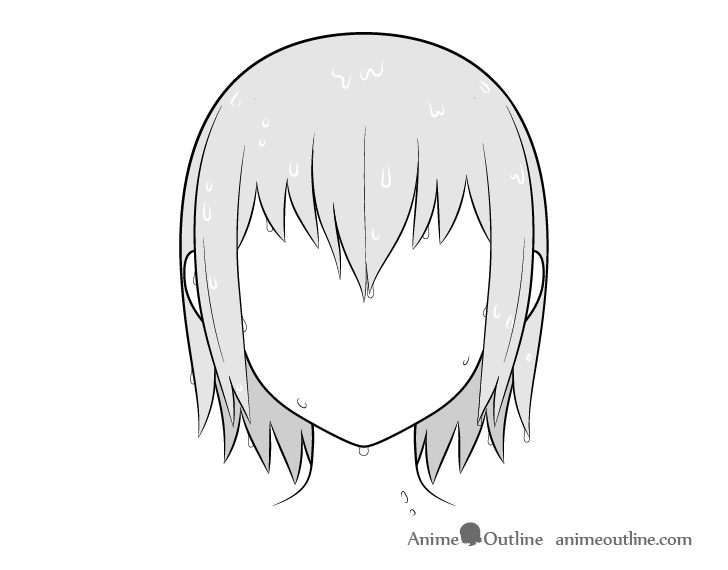 Anime and manga scenes involving rain, baths and swimming are all very likely to show wet hair. The same can be true for action scenes involving water or even a character that’s simply sweating a lot. 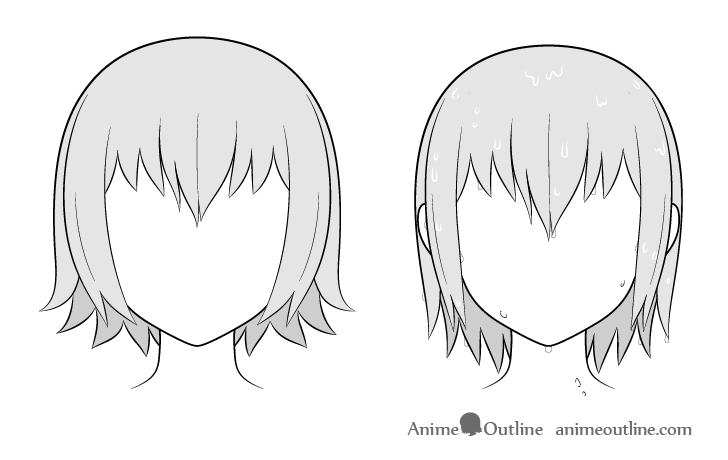 Though drawing wet hair is not that much more difficult than drawing normal (dry) anime hair there are a few rules you can follow to help you show that the hair you are drawing is actually wet. 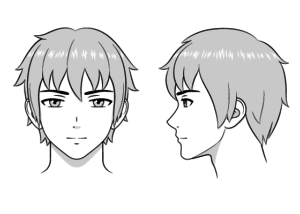 Before drawing wet hair it’s a good idea to at least estimate what the dry version of the same hair will look like. 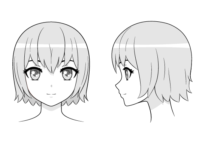 You can see the “dry” version of the hairstyle used for this tutorial above. 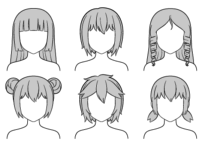 Though the tutorial uses only one hairstyle as the example you can apply the same method to draw most other common anime hairstyles. 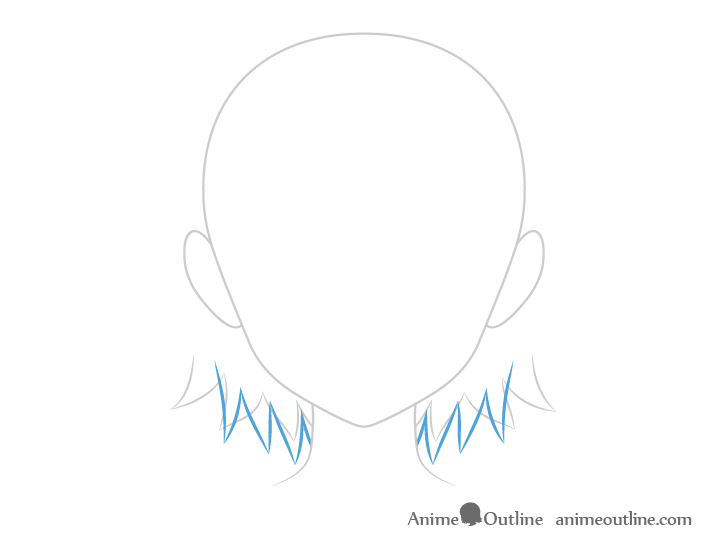 To help make the drawing process more manageable and to better keep track of how hair transforms when it’s wet we will split the hairstyle into three parts. For a quick explanation you can basically think of the hair as front, side, and a combination of back/top. Before drawing the hair you should make an outline drawing of the head and draw the hair overlapping over top of it. You can erase the hidden parts of the head later. Draw the front section of the hair hanging lower down on the face than normal with the individual clumps pointing more downwards to show that they are heavy with water. You can also draw the clumps closer together near their base. 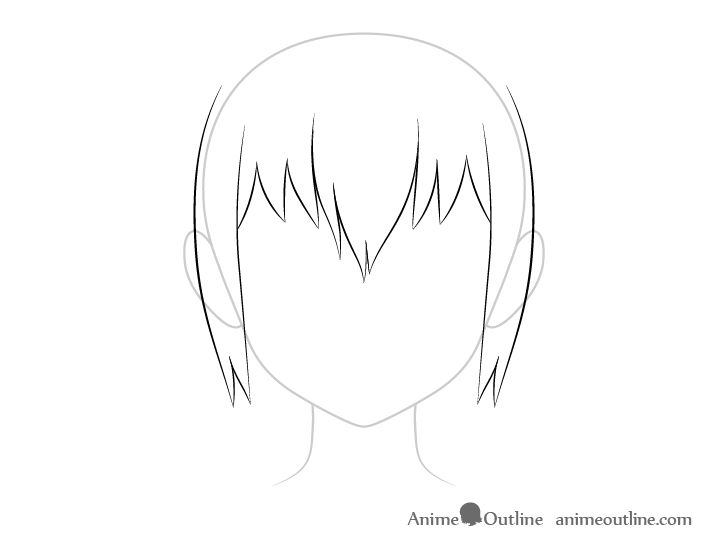 Doing so will make the hair look like the hair is sticking closer to the forehead as wet hair is likely to do. 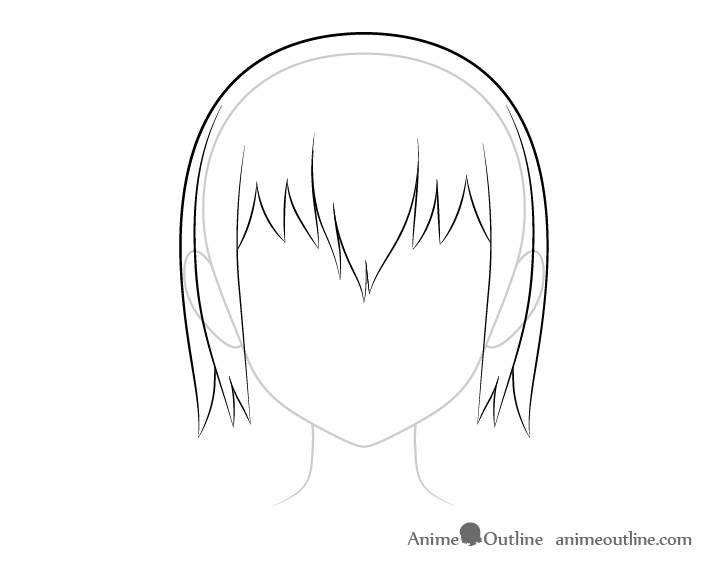 As this hairstyle is fairly simple you can go ahead and draw most of the individual hair clumps right away. 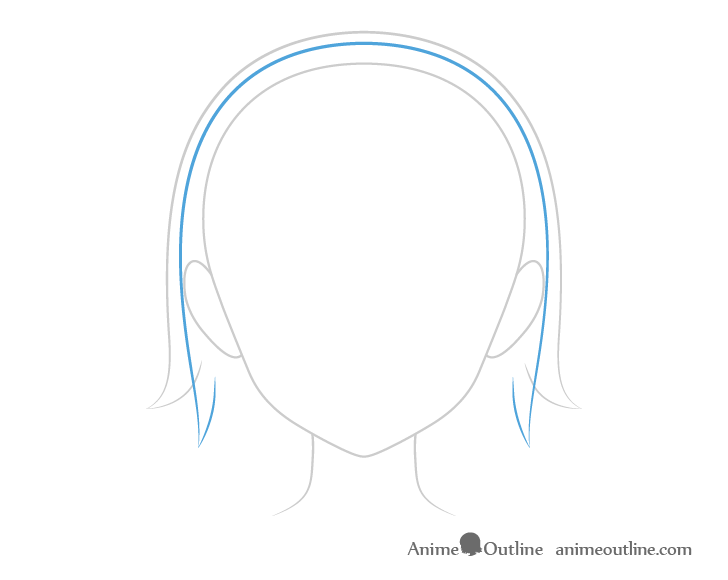 Though the drawing example shows dark line for the hair you may still want to draw light lines that can be easily erased if you are using pencil and paper. Above you can again see how the wet version of the sideburns is likely to look compared to the dry version. They will have less volume and instead of hugging the face will hang almost straight down. To make the changes easier to see the comparison drawing shows the sideburns on their own but your drawing should look something like the examples above. 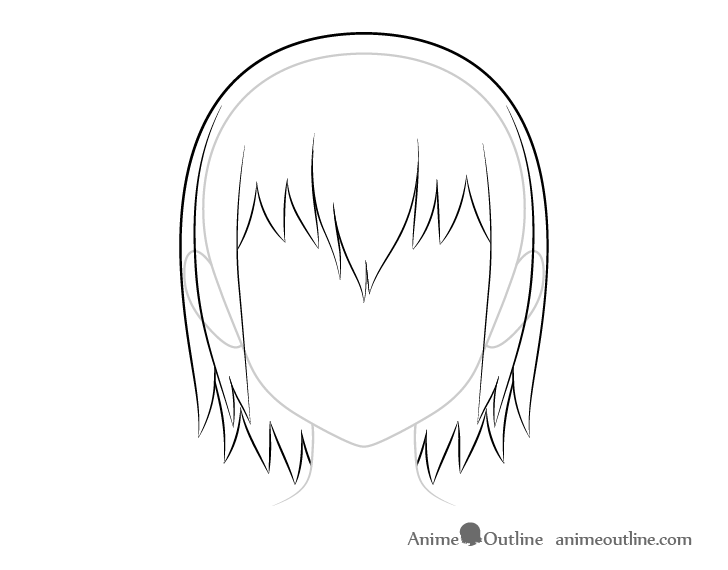 For the top part of the hair the main change will be less volume with the bottom clumps again hanging more downwards instead of curving to the sides. As in this particular hairstyle the back/bottom section of the hair fans out the most it will also have the biggest transformation going from dry to wet. In the wet version draw the various clumps as though they’ve been “squeezed” together. At the same time again draw them pointing downwards and hanging lower down. 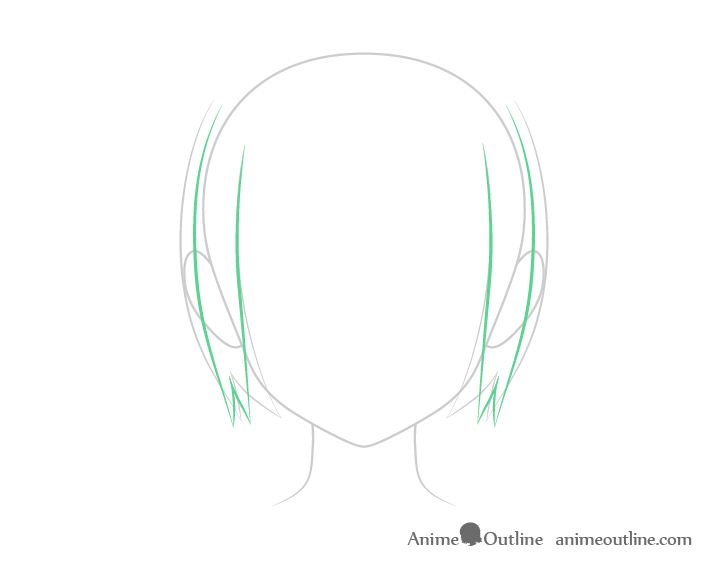 You should have a pretty much finished outline drawing of the hair once you finish the back section. For this short step you can simply erase the parts of the head that are covered by the hair and make any other small tweaks you may feel are needed. As it was recommended earlier to make a light line drawing of the hair first at this stage you can go over it with darker lines. To make the hair look a bit more interesting you can add a few inner splits/folds to some of the clumps. For this very basic example we will only add three. 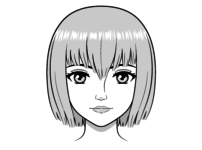 But if you want a more detailed drawing you can add more in various places. If you are going to be shading the drawing using pencil and paper you may want to see step nine before proceeding further. 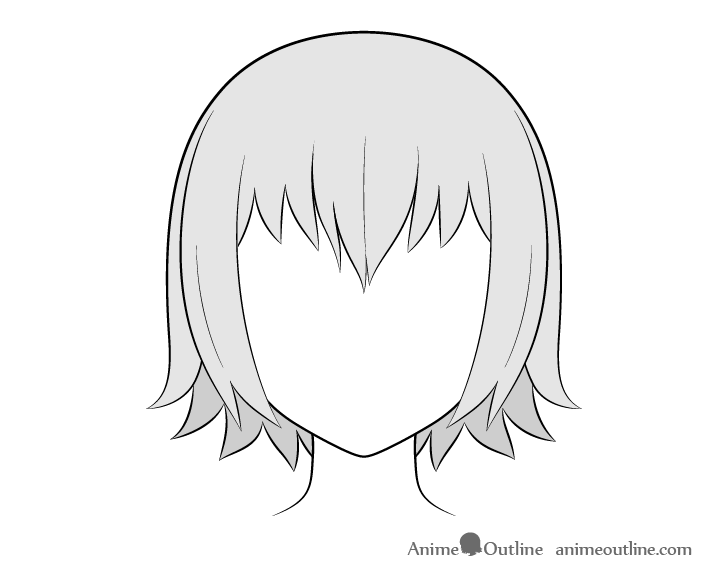 For this very basic shading you can simply fill in the hair with one solid shade of grey or color. Shade the “bottom back hair” slightly darker. Now to further reinforce the idea of the hair being wet we can add some small water drops in several spots on the hair clumps. 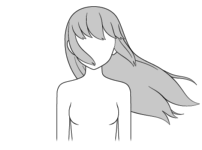 For this stage only draw the water drops that are either hanging on the tips of the hair or rolling down it’s sides. Make the shapes of the water drops narrower towards the top and wider towards the bottom for the ones on the tips of the hair. Draw the drops rolling down the sides similar in shape to upside down question marks. You will notice there are also a few drops drawn on the actual face and neck. If a character has water drops in their hair they will most likely have them in those places as well. 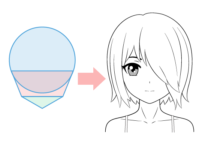 For this step you can add the next set of water drops that will be drawn inside the main shape of the hair. Quite often in anime and manga the outlines of these are drawn in white as otherwise they would be very hard to see on darker hair. This makes this set of water drops a little bit harder to add if you are doing pencil shading. One thing you can do is to simply leave these areas white and shade around them. If you want to do that then you can draw fewer “inner drops” to make the process less tedious. Alternatively you can use something like gouache paint to draw the drop right over top of the pencil shading. If you are drawing digitally then you can simply draw the drops right over top of any color or shading. For the shapes of these drops you can draw most of them similar to a “U” shape that gets slightly wider towards the bottom. You can also combine several drops together in wave like shapes. If you want to show hair that’s really soaked draw these wave shapes larger and make more of them. Once you finish drawing the “inner hair drops” you’ve pretty much gone over everything you need to draw wet looking anime hair. Above you can see a side by side comparison of dry and wet hair. 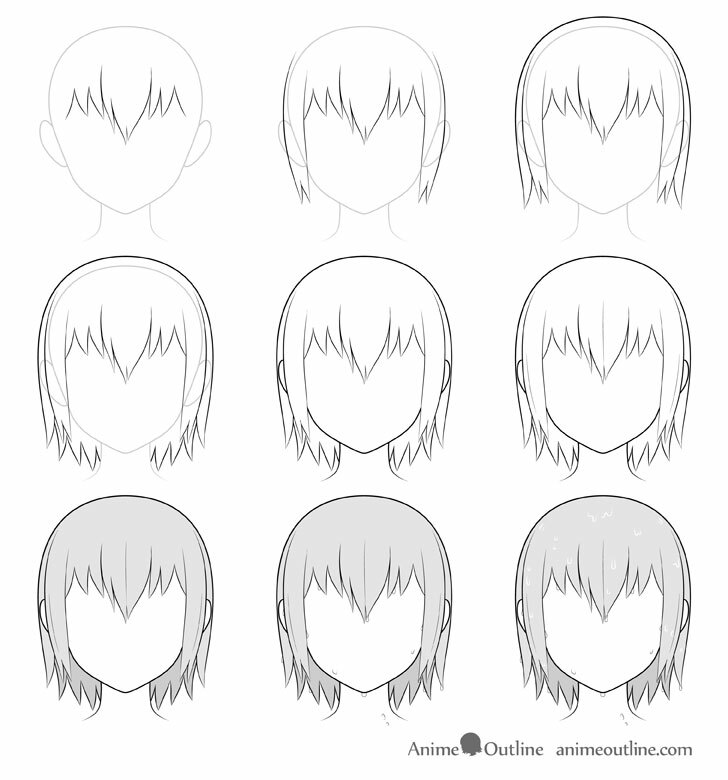 The steps to drawing wet anime and manga hair are not much different from drawing normal (dry) hair in the same style. The main characteristics of wet looking hair are less volume and downwards pointing hair clumps. You can also add a few water drops to further show that the hair is wet.